the Old product (Fig. 368 a). Dress of woolen fabric potrebnoe waist, straight silhouette, long set-in sleeves. The second piece is a dress made of woolen fabric, neotrazimoi waist, straight fit, patch pockets (Fig. 368 b). New product (Fig. 368). 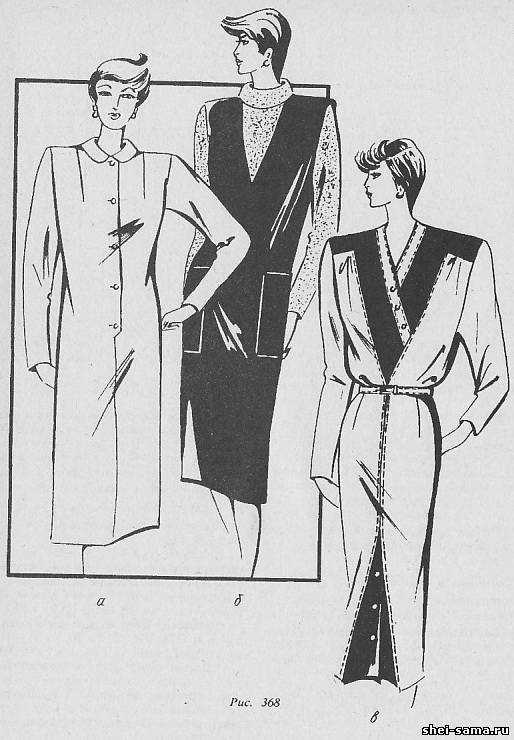 Dress cutting through the waist, set-in sleeves, deep neckline. Runs from old products of a contrasting color. Construction drawing of the model (Fig. 369, 370). Display main parts: upper back portion, upper front, lower back, the lower part of the front. The circuits are applied to the chest line and the lines limiting the width of the back, the front. Line of the armhole on the back and the front is made through the points P1, П31, 1 and P5, П61, 2 smooth lines. The beginning of the side cut is located at the middle of the width of the openings. Tuck in the shoulder cut of the back can be moved to the neckline of the back. The drawing is a front planned location of the cutting upper part of the front, clinofibrate yoke, straps and front. The cutting width of the upper part 8 cm strap Width 3 cm Part of a breast tuck is designed to seam primaqiune strap, with the remainder going to the Assembly from the yoke. The width of the yoke П51П52 = 6.5 cm. Sleeve (Fig. 371). Builds a right angle with the vertex at point O2. Through the point O2 are horizontal and vertical lines. 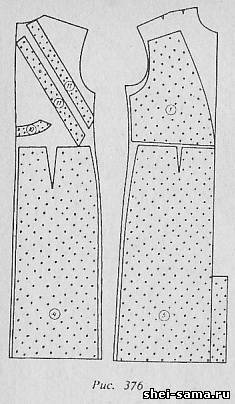 The height of the crown is equal to 15 cm Through the point O1 draw a horizontal line on which is deposited the width of the sleeve equal to the measurement of the arm circumference (Op) plus the increase in free fit. Segments О1Р1 and О1Р2 split in half. О1Рп = О1Рл = 9.5 cm. Р2Р12 = Р1Р11 = 4cm. Connect the points P12, P3 and P11, 1 straight lines. Segments Р12Р3 and R111 divided from the middle of the regenerate normals 5-6 = 1.5 cm and 7-8 = 2 cm. Line of lifts the sleeve is carried out through point P12, b, P3, O2, 1, 7, R11. Points P2M and Р1М2 are connected by straight lines. From points P2 and P1 down deposited 20 cm, put point 4 and 3. 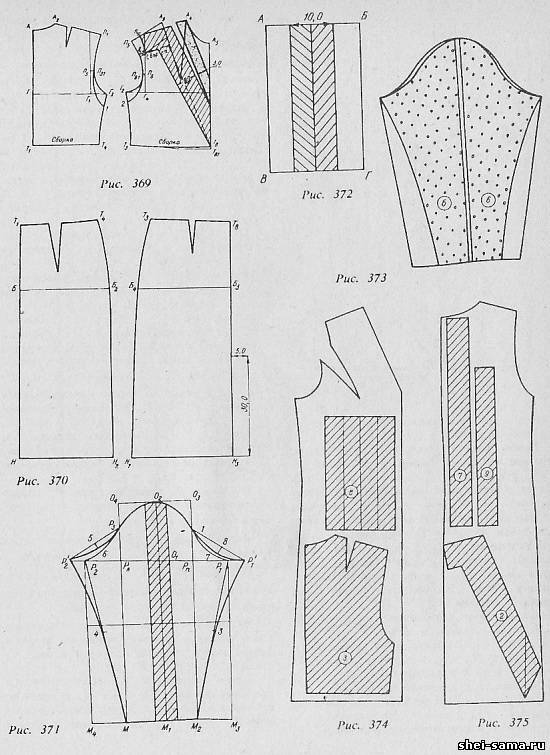 Sections of the sleeve are held through the points P12, 4, M, and R11, 3, M2 smooth lines. layout parts cut are shown in figures 373, 374, 375, 376.